Central Iowa Phi Kappa Psi met on March 30, 2019 postponed from a blizzard weekend in February. Collegians from Iowa State and the University of Iowa joined alumni to provide updates and celebrate Founders’ Day. Daily challenges that face those with disabilities are usually unfathomable to the average, always on the move college student. Not only do physical limitations require extensive personalized care, but community integration and fulfillment is often something not included in the long-term rehabilitation process for persons with disabilities. Especially in the collegiate capacity, involvement and support is crucial for self-actualization. 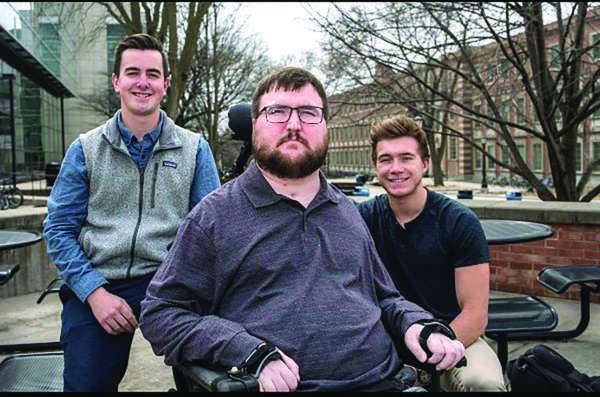 Three Phi Kappa Psi brothers at the University of Iowa recognized this little- known issue and have come together to address it in the form of a nonprofit they call Students Care, a 501c3 focusing on collegiate students with disabilities. The agency coordinates student to student care through Medicaid, volunteerism, and Consumer Choice Option-funded programs. Their goals are twofold: To provide reliable home care and improve the overall quality of life for both parties by building relationships between the two. They provide full time care, tutoring, on-call responders, and above all, friendship. 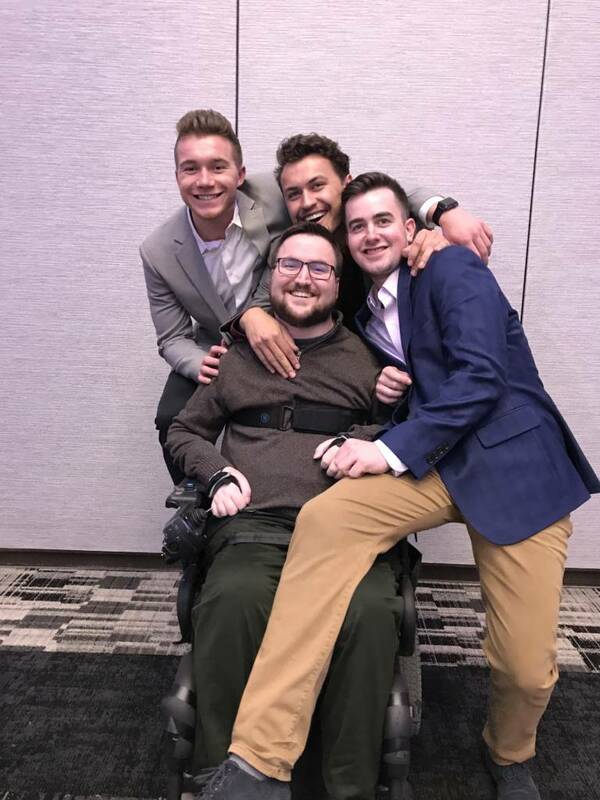 Michael Penniman enrolled as a sophomore at the University of Iowa in the fall of 2016, after an accident had left him quadriplegic his freshmen year of college, four years prior. Due to the severity of the accident, he had to put his education on hold. While several home care organizations were made available to him, he was consistently disappointed and shocked at the level of care he was receiving. His scheduled visits were broken up into three shifts, and usually spanned up to six hours a day. These visits were intended to give him the support he needed to live on his own and finish his schooling. Visits consisted of stretching, bathing, dressing, eating and getting from points A to B. The first semester of school was a struggle as he was unable to receive basic care when employees missed shifts or neglected to show. The lack of organization with these providers posed a huge threat to his health. His coursework suffered and he had very little social interaction on campus. Penniman deserved adequate service, but he also wanted to maintain some sense of normalcy. He called on family friend Peter Easler (Iowa ’17) for support to help fill in the gaps between his home service visits. Easler gave his support, kept him company, and even took care of Penniman physically when his providers could not. When Iowa Home Care was forced to cancel their entire 50-hour care booking with Penniman due to understaffing, it was Easler and his Phi Psi brothers that assumed responsibility. In the wake of the home care disaster, Penniman officially dropped his provider, and the idea for Students Care was born. Their team started off small as Easler got together with fellow pledge brother Jacob Newcomb (Iowa ‘17) to enlist four other students to help. Together, they successfully assisted Penniman in becoming better acclimated to life on campus while giving him the consistent care he needed. These were the first steps Students Care took to become a legitimate organization. Now a fully-functioning nonprofit, Students Care utilizes the availability of Medicaid waiver funds, which allow those with disabilities to hire their own care team rather than using state-funded home care. This gives more freedom to the clients. The Students Care initiative is still learning and growing while setting the foundation for making a difference in the lives of many students. Co-founder Penniman remains a client of the organization, and primarily serves as Director of Outreach. The uniqueness about this organization is that it is mutually beneficial. Penniman receives care up to six hours per day and he has worked with every employee (now 12) directly to ensure they understand the Students Care mission. Given the newly-found stability and support this organization has made possible, as well as being involved in the operation himself, Penniman was officially initiated into the Brotherhood of Iowa Alpha this year. The clientele base is slowly growing. Students Care works with another student from Kirkwood Community College to integrate him into the University of Iowa community by providing more opportunities. 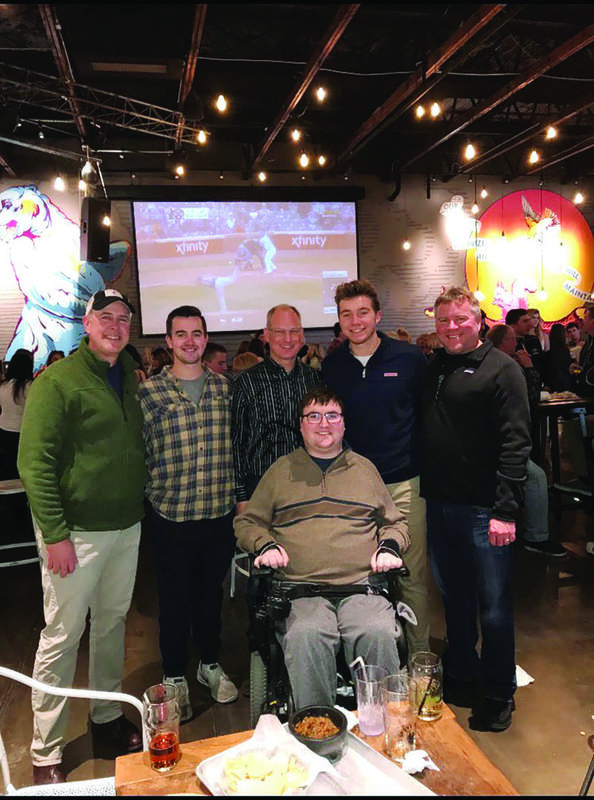 Mark Easler (Iowa ’86), Peter Easler (Iowa ’17), Anthony Penniman (Iowa ’86), Micheal Penniman, Jacob Newcomb (Iowa ’17) and his father enjoying a night out together. So what’s next for Students Care? Easler is currently developing a scheduling interface app that would allow employees and clients to plan efficiently for home care visits. The app would also allow for a large- scale expansion for other universities and communities to easily integrate. The prospective app will include not only scheduling for both parties, but community engagement involving social activities and medical support beyond shift scheduling. 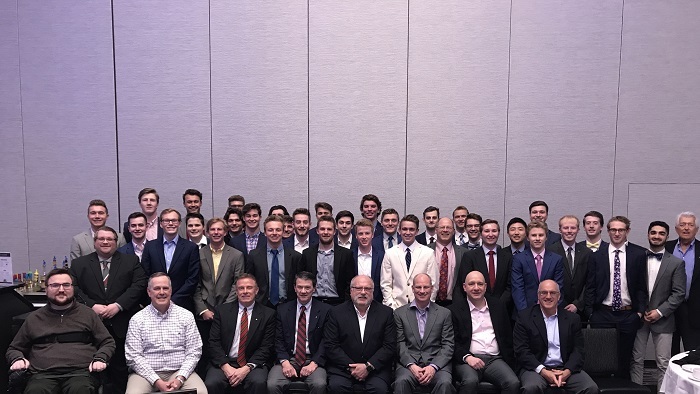 The momentum for this movement is growing, and we proudly recognize our three Phi Psi members who have laid the groundwork for this life-changing organization. We can’t wait to see it flourish.